Why use this strategy in Reading? A majority of students in the upper elementary and middle grades are beyond decoding instruction and need more assistance with comprehension to help them become successful, independent readers. Strategic reading allows students to monitor their own thinking and make connections between texts and their own experiences. Students who make connections while reading are better able to understand the text they are reading. It is important for students to draw on their prior knowledge and experiences to connect with the text. 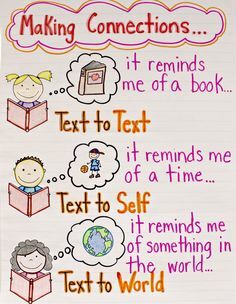 Students are thinking when they are connecting, which makes them more engaged in the reading experience (Allen, 2015). What type of student does this strategy help? Before practicing this strategy in the classroom, create a list of personal connections to the particular text for which you will be modeling this strategy. ​When teaching this lesson, the students will listen or read the story and use the graphic organizer listed above. 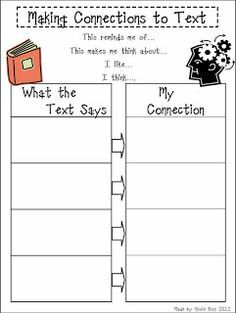 This allows the students to deepen their knowledge and comprehension of the text they are reading. In literacy it is pretty self explanatory in the paragraphs above as to what to ask for questions to the students. When teaching a lesson where students are to make connections to the text in math, the students would read their text books word problems and connect to the word problems to better comprehend what the problem might be asking. For example, connecting the text to self by using your name instead of the name listed so it is more relatable. When teaching a lesson in science that deals with making connections, have the students read research papers on lab results. This will be a very hard text for them to comprehend. It will challenge the students to use their making connections strategy to comprehend the material that they are reading.